Owners of the original Moto X (2013) can now rejoice, as they will be receiving an Android 5.1 update soon. Motorola’s Senior Director of Software Product Management, David Schuster has announced in a Google+ post a few hours back, that they have started the Moto X (1st Gen.) Android 5.1 soak test in France and Germany with more deployment next week is its successful. The talks about Moto X (2013) receiving an Android 5.1 update has been in the air for quite some time now. If everything goes out as planned then Moto X (2013) will soon be in a for a sweet lollipop treat. There is not much improvement in 5.1 over 5.0.2 , but who doesn’t like to have the latest software update on their devices? Carrier locked variants of the device will receive the update a bit later than the unlocked versions but Schuster has promised that all devices will receive the update. Do you own a Moto X(1st Gen.) device? Have you flashed your device or are you still waiting for the OTA? Let us know in the comments below. 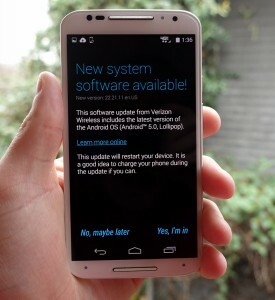 The post Moto X (1st Gen) to receive Android 5.1 update appeared first on AndroidGuys.